This is lesson 7 of 42. This series is currently in-progress and will have new lessons each week, visit Bethany’s author page to see the latest available. Start out by reading this week’s memory verse (Deuteronomy 7:9) and then asking if anyone in the group can define the word faithful. Explain that when we say God is faithful that means that God keeps His promises and always does what He says He will do. Ask a couple of kids to come up and act out what being faithful might look like (or what being unfaithful- not keeping promises may look like. After the skit, explain that you want to tell them a story from the Bible that explains God’s faithfulness. Hosea was a prophet of God during a time when the people of Israel were particularly unfaithful to God. God had continued to be faithful to His people (as He always is), but His people weren’t being faithful to Him~ they were worshipping false gods and turning their back on God. In order to teach the people of Israel about God’s faithfulness and their unfaithfulness, God told Hosea to marry a woman named Gomer who wouldn’t be faithful to him~ someone who wouldn’t keep her marriage promises to him and would leave him to love another man. God told Hosea that every time his wife left him and broke her promises to him that he should take her back and forgive her. God wanted Hosea & Gomer’s marriage to be a picture of God’s love for His people. God wanted the people to see that even when they are unfaithful and follow other gods that He is always faithful. Over and over in the book of Hosea, God sends Hosea to the people of Israel to tell them to repent of their unfaithfulness and come back to Him. Then, He tells Hosea to tell the people that He will punish their unfaithfulness, but that He will still be faithful to His promise to rescue His people and will forgive them when they repent. Since motions & actions help kids remember, choose an action for FAITHFUL. A good motion might be to cross your fingers as a sign of making a promise, or shake your neighbor’s hand. SAY: “This week’s memory verse is Deuteronomy 7:9. This verse reminds us that God always keeps His promises, that He is faithful, by reminding us that He has kept all of His promises.” As a group come up with a list of promises that God made and kept in the Bible. (EX: promises to make Abraham into a great nation – the people of Israel grew from 1 family to a whole nation is Egypt, He promised to send a rescuer and Jesus came). Have the kids help you think of other examples. Read the memory verse (Deuteronomy 7:9) a few times together and do the motion for awesome. The truth we see in the Bible is that all of us are like Hosea’s wife. We have all sinned and are all unfaithful to God. The story of Hosea and his wife is the story of all of us and God. The story of the Bible though is that while we were still sinners, Christ died for us (Romans 5:8). Read 1 John 1:8-9. That’s the good news. God promised long ago to rescue His people and He is faithful and will do what He said He would~ and He fulfills His promise through Jesus. Give each child a blank piece of paper provide markers or colored pencils. Encourage them to write the word faithful somewhere on the paper and then write or draw something to help them remember this attribute of God. 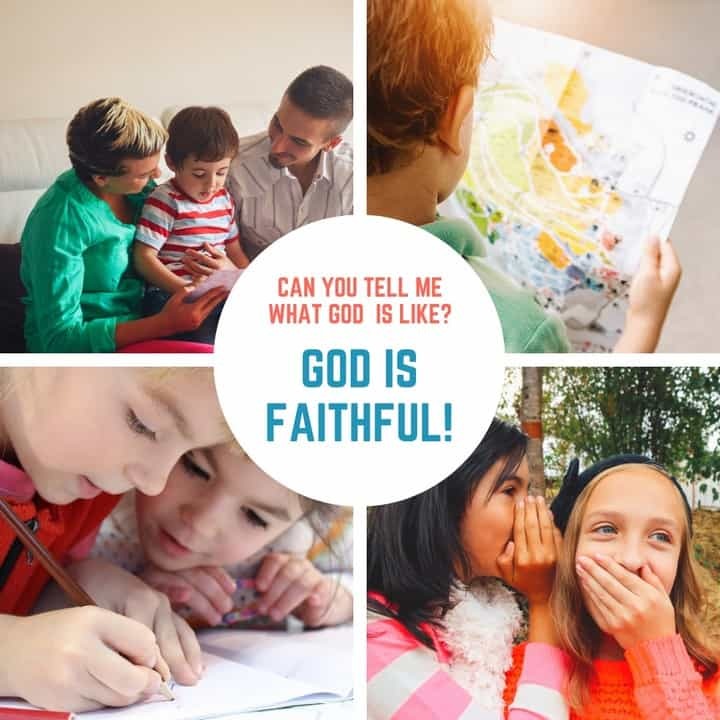 They could write the definition for faithful or the memory verse or they could illustrate any of the passages you read about God being faithful. After a few minutes, bring the group back together and give kids time to share what they have drawn or written. Pray that the kids in the group would come to know God more and more each week through this study and that they would learn to trust God’s faithfulness in their life knowing that He will always do what he has promised. Filed Under: Hosea, Lesson Plans, What is God Like?